Magnetic Resonance Imaging, commonly referred to as MRI, is a very valuable tool that allows medical professionals to see detailed images of mostly soft tissue and organs (that don’t show up well on x-ray) without the need for exploratory surgery. Over the last two decades the increased availability of MRI services has corresponded to a marked increase in surgery to treat chronic lower back pain (LBP). MRI technology is very useful in examining soft tissues such as spinal discs and muscles. However, the research points to a problem with relying too much on this technology for treatment of rheumatic issues (painful conditions associated with joints and connective tissue). MRI scans often visualize anomalies in joints and tissues that are not necessarily the cause of pain. One study indicated that “evidence suggests that MRIs may often be ordered unnecessarily. More studies are needed to examine the appropriateness with which imaging procedures and non-invasive/minimally invasive treatments are utilized, and their effect on patient outcomes” (Pain Med 2006;7:143-50). Medical doctors can sometimes be too quick to diagnose pain problems based on MRI results. They are also more inclined to utilize pain medications and/or invasive surgery in an effort to fix problems believed to be identified by the MRI scans. Even in cases where MRI scan correctly identify the source of pain, surgery or medication may not be the best treatment. The majority of spinal problems have a mechanical basis. That is, improper spinal motion causes the damage that leads to pain and poor function. Chiropractors specialise in finding and resolving spinal problems pain issues by identifying areas of improper motion, restoring this motion, and helping people to maintain proper motion in their spine. At Canberra Spine Centre, our thorough initial consultation helps us to determine the source and cause of pain or other symptoms. The right diagnosis directs our chiropractors to administer the most appropriate therapy and rehabilitation protocols to achieve the best and most sustainable result possible. Reliance on MRI technology and related treatments also corresponds to dramatically higher costs of health care in recent years. A recent report on health care expenditure in the US reveals: “recent studies document a 629% increase in Medicare expenditure for epidural steroid injections; a 423% increase in expenditure for opioids for back pain; a 307% increase in the number of lumbar magnetic resonance images among Medicare beneficiaries; and a 220% increase in spinal fusion surgery rates” (Journal of the American Board of Family Medicine, 2009). This increase in costs could be justified if patient outcomes were improving, but the same research indicates that this is not the case. It seems that increased health care expenditure does not necessarily equate to better patient outcomes. The report states, “We suggest a need for a better understanding of the basic science of pain mechanisms, more rigorous and independent trials of many treatments, a stronger regulatory stance toward approval and post-marketing surveillance of new drugs and devices for chronic pain, and a chronic disease model for managing chronic back pain” (J Am Board Fam Med 2009;22:62-8). The trend of MRI scans leading to more back surgeries and prescriptions of powerful, often addictive pain killers is one we are aware of at Canberra Spine Centre. At Canberra Spine Centre, we believe that surgery should be a last resort after less risky and less invasive treatments have been trialed. Back surgery is an expensive and risky proposition, given the complexity and extremely delicate nature of the spine and the central nervous system it protects. Aside from the impact of increased health care expenditure, inappropriate surgery carries unnecessary risks including infection, death and other complications. Evidence also points to the fact that surgery is not more successful than non-surgical treatment with exercises and cognitive intervention. A study of 124 patients concluded that “long-term improvement was not better after [surgery] compared with cognitive intervention and exercises” (Ann Rheum Dis 2009; Epub). Chiropractic treatment is an effective, non-invasive method that focuses on restoring proper motion to the spine to help restore proper nervous system function, enabling healing to occur. Improper spinal motion is not only the cause of back pain, but is frequently the source of problems that affect other parts of the body. By focusing on the health and care of the spine, many painful conditions, including LBP can be resolved without expensive and traumatic medical procedures. 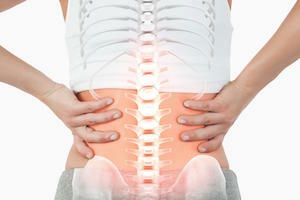 Frequently the source of pain is the dysfunction and damage that accompany minor alterations in movement of the spine. Chiropractors call these vertebral subluxations (an area of poor motion between vertebra resulting in uneven stresses on the supportive tissues in addition to altered nerve function). Chiropractors locate and treat these misalignments with gentle chiropractic adjustments that help restore proper motion. This, in turn, will often relieve muscle tension, help reduce inflammation, and decreased the stress response in the body related to aberrant nervous system function. At Canberra Spine Centre, we have a holistic, non-invasive approach to restoring proper spine and nervous system function to help people with back pain and many other health problems. Our approach utilizes appropriate manual therapies in addition to advice on exercise, diet and lifestyle. If you are concerned about lower back pain or other nervous system-related problems, schedule an appointment with us to see if we can find the cause of your problems and provide you with a safe, effective treatment strategy that is customized to fit your needs. Call today (02 6257 9400) to receive our special offer ($280 value for only $75) for a thorough examination and a consultation. Come see us today and let us help you to experience a healthier you. Book online or call us on (02) 6257 9400. Frozen Shoulder Syndrome: Worse than a Cold Shoulder?